Here are four tips for writer-parents to find the right balance. 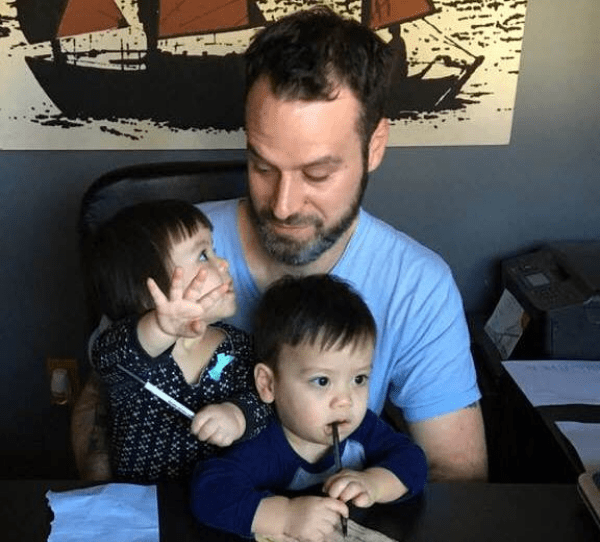 As a teacher, father of twin toddlers, and author of four poetry collections who, pre-parenthood, was used to writing every day, I have had to reconfigure my writing life the past two years to ensure my creative flame remains lit…not just lit, burning as bright as before. But how to carve out the time to write around a parent’s hectic, often sleepless schedule? Here are four tips for writer-parents to find the right balance. 1. Early mornings and late nights. Waking up at 5 am for an hour of writing before the kids rise may sound torturous, and at first, it was exactly that. Similarly, writing in the middle of the night after the kids go to bed. Sleep may be essential to clear-headed parenting but so is retaining your passions and individuality. Can you find two mornings and two nights per week to write, even if it’s just a half-hour? I’ve also found that writing during odd times of day, often exhausted, actually opens my mind to new ways of composition. Thoughts flow differently, making unexpected connections, which may deepen your work. Work breaks. Naps. Family visits. There are likely morsels of time you can steal from your regular schedule to allow for a little writing time, at least note taking. I’ve found it helpful to always have a small notebook with me at all times. And I get a lot of writing done while driving to work, simply recording my voice into my phone. 3. Reprioritizing the little things. Let your kids help! Many kids are eager to sweep, wipe counters, fold laundry, and go shopping with you. Yes, these chores take twice as long with their “help”, but it has a triple-fold effect: personal bonding, teaching household responsibilities, and opening up more time for you to write. Find less time-consuming ways of doing things! Go shopping less frequently by buying more (non-perishables) than you need that week. Don’t clean every inch of the house every day; concentrate on the kitchen and bathroom only. Bake a casserole, make soup, or boil enough pasta to allow for at least two full meals; cooking meals every day can cut at least a half-hour from your writing time. Share responsibilities! If you have a partner or co-parent, create a schedule that allows for both parties to enjoy regular personal time. For example, weekend mornings I visit a local café for two hours to write. Then my wife does the same. That leaves four hours of guaranteed writing time per weekend, not including naps. 4. Write with your children. Don’t hide your love of writing from your kids. Incorporate it into your bonding time. Turn it into a fun ongoing project. Write poems together. Compose lines based on their drawings. Create characters together (my son’s favorite character is Mr. Vacuum), and make a game of inventing a world for them, writing down what the characters do until you have a short story you’ve written together. A father of twin toddlers, John Sibley Williams is the author of As One Fire Consumes Another (Orison Poetry Prize) and Skin Memory (Backwaters Prize). A nineteen-time Pushcart nominee and winner of various awards, John serves as editor of The Inflectionist Review. Publications include: Yale Review, Atlanta Review, Prairie Schooner, Massachusetts Review, and Third Coast.